To maintain a healthy teeth, you must brush your teeth daily with a toothbrush. But brushing cannot removes the plaque between your teeth. Brushing on its own can only clean around sixty percent of tooth’s surface area. To clean the food debris and the plaque efficiently you should use either a dental floss or a brush. Yet, many people don’t feel comfortable with the dental floss and using a dental floss you may bleed your gum. Also dental flosses are not effective when the gaps between your teeth are bigger. In these circumstances you have to pick an interdental brushes instead of the dental floss. This kind of brush have bristled small heads that are especially aimed to clean the spaces among your teeth. They are disposable and are supplied with a reusable angled plastic handle. To use an interdental brush, softly push it back and forth between your teeth along your gum line, but do not force it, as it can damage your gums. Ask from your dentist to show the process of using the brushes if you are not sure. The Interdental brushes are available in different sizes which enables you to select the size which is suitable for you. As different teeth in your mouth are spaced differently, you may need to use two or more sizes of the interdental brush. 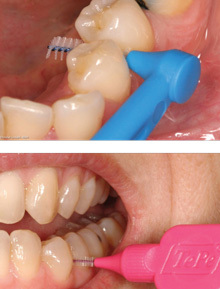 How to use an Interdental Brush? Move the brush back and forth gently between the teeth. We invite you to take a look at our interdental Brush which lets you keep your dental health by letting you clean teeth intervals and gums. They come in different shapes of straight, taper and football.